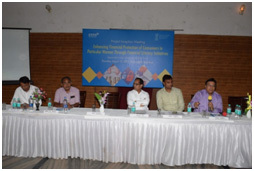 A Project Inception Meeting on Enhancing Financial Protection of Consumers in Particular Women through Financial Literacy Initiatives, supported under Consumer Welfare Fund, Department of Consumer Affairs. 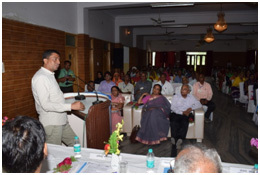 Ministry of Consumer Affairs, Food and Public Distribution, Government of India was held on 17 August, 2017 at Hotel Padmini, Chittorgarh, Rajasthan. Total 126 participants were participated. The project launchmeeting started with welcome speech of GauharMahmood, Assistant Director, CUTS Centre for Human Development,Chittorgarh. In opening remarks by George Cheriyan, Director CUTS International spoke on overview of the project that it is found that poor and vulnerable community particularly rural women are unable to come out of poverty due to poor saving and investment habits. The women are more vulnerable compared to their male counterparts, because they are less control of finances but although women have important contribution in adding family income and livelihood activities. But in decision making their role is very limited that’s why women have not much access to the financial services.He shared some facts and findings of the base line survey conducted in Chittorgarh and Bhilwara districts, said that 76 % women don’t taking decision on their financial issue, so it need to access vulnerable consumers towards financial inclusion, he explained about the rights of financial consumers and given focus to enhance the capacity of financial consumer particular women towards financial literacy. He shared that the baseline survey is conducted to assess the ground realities of financial consumers, awareness level about the financial consumer rights, their involvement capabilities in financial matters and inclusion. Total 1150 sample size collected from 23 blocks of two districts and found in income groups: 36.78% consumers are below 25000/- annual income, 37.13% are from 25-50000/- , 16.52% are from 50-75000/- 6.35% are from 75-10,0000/- and 2.87% are above 100,000/- annual income. In occupation: 32.17% are doing farming, 2.26% cattle rearing, 13.56% labour work, 5.04% business. In other areas: 82% women contribute in family income, 89% says have bank and post office accounts, 70% says not sufficient amount for saving deposit, 09% women deposits saving in her male counterpart, 54% people borrow money from local lender in case of need, 72% people are not much aware about the government financial schemes i.e Jan DhanYojna, Atal Pension Yojna, Kissan Credit card, RuPay Debit Card, JeevanJyotiBima, JeevanSurakshaBima, Mudra Yojna, BhamashahYojna.The consumers’ respondent about their investment/savings: 89.52% in Bank, Post office 5.09%, Private finance company 1.20%, share market 0.60%, cooperative society 2.99%. He also explained about the awareness about grievance redressal mechanism, methods uses for money withdrawal and also some important findings, 85% respondent don’t have any credit cards, 73% don’t know the difference between debit and credit cards, 94% people never uses online transfer, 74% are not covered in life insurance, 85% don’t have accidental insurance, 90% are not aware about mutual funds, 87% people uses basic mobile phones, 86% don’t uses mobile wallets etc. Inaugural Address by Suresh Dhakad, MLA Bengu, Chittorgarh spoke that women should come forward to get financial information, training and education and avail the financial services, are providing by state and central government i.elabour card, Jan DhanYojna, Pension scheme etc. 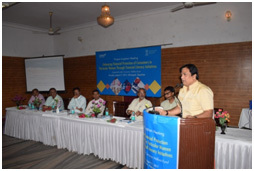 Special Address by Narayan Singh Charan, Additional District Magistrate Chittorgarh spoke that many people are not aware about how to use the ATM, Paytm and other E-banking facilities, this project will bring revolution in the life of financial consumers and will help to increase the level of knowledge, behavioral pattern and will allow the more efficient and adequate financial knowledge. Special Address by Sushil Sharma, Chairman, Municipal Council Chittorgarh given thanks to CUTS team for implementing the project on Enhancing Financial Protection of Consumers in two districts, he spoke on digital literacy is need of today and every one should be learn and link with this financial initiatives, he explained about the benefits of Bhamashah (Health Security Scheme) and asked to participants to linkages with banking services, need to change the financial behavior and understanding about the financial products and services. Deepak Saxena, Assistant Director, CUTS said the financial literacy is a now the consumer rights issue, He explained about the background of RBI formation, regulatory authorities like SEBI, IRDA etc. 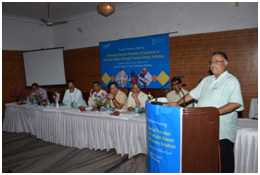 He shared the facts of banking sector and financial literacy/inclusion and challenges faced by financial consumers and said this project will build the capacities of rural consumers in term of financial literacy their by enhancing awareness, knowledge and skills among the target community on the financial related. In opening speaker of technical session, Munish P Kothari explained the financial literacy status of women and said the ground reality is very different the large section of women are not linked with financial scheme and need to work on it, he has informed about various banking facilities, bank negative attitude towards poor financial consumer and explained about banking ombudsman mechanism. Alok Jain, Regional Manager explained about safety measure while using ATMs or digital transactions and asked to all participants to link their account with Aadhar number, aims to bring more transparency among the bank consumers. The participants raised many quarries/ clarifications related to financial services, banking redresses system; He given appropriated responses to all participants during the open ended session on financial inclusion through various initiatives. SachinBadetia spoke on importance of Kisan Credit Cards Scheme aims at providing need and timely credit support to the farmers for their cultivation needs as well as non-farm activities and cost effective manner to small farmers. He said this project would help to cover more farmers through this flexible and operational freedom credit utilization scheme. 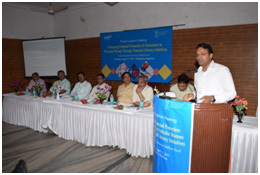 Sanjay Bhardwaj given detailed about the banking schemes and expressed that the CUTS programme for Financial Protection of Consumers would bring the positive change Particular Women through Financial Literacy Initiatives and will ensure the economic security of rural consumers by linking them with government/non-government developmental scheme. MadanGiriGoswami, SrProgramme Officer was the convener of the event and also said based on the outcome of baseline, consumers would be identified into Financial Literacy Groups in clusters. These groups would then be provided training with the support of expert trainers and would be involved in networking with various banks, financial institutions and governmentdepartments with sustainability point of view.GaytriMoud, Programme Assistant given Vote of Thanks to all participants, Total 126 people attended the event.